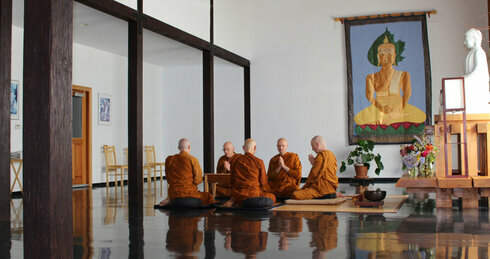 Birken Forest Monastery (Sitavana)was established by the Canadian-born Abbot, Ajahn Sona, in 2001. It is located well off the grid near Kamloops, BC. The main building of nearly 10,000 sq.ft provides a suitable environment for living the contemplative life all year round. The monastery aims to be a place that is supportive of personal spiritual development for all sincere people of all backgrounds and religions. It also aims to maintain a very high level of energy efficiency and be a model of simple, green living. 'Sitavana', means 'cool forest grove'. Birken Forest Monastery is an Associated Monastery.